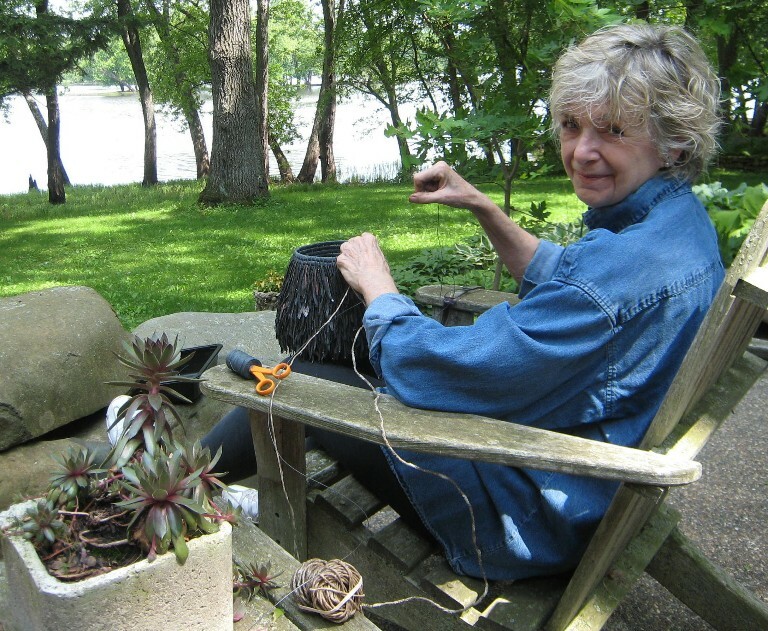 We mourn the loss of Mary Giles, an internationally recognized fiber artist who was a founding member of our National Artist Advisory Council. Mary died April 11, 2018, at her home on the St. Croix River near Stillwater. This collaboration with Mary and her husband Jim Harris (who helped stage the exhibition with Textile Center’s exhibition coordinator Kraig Rasmussen) resulted in Mary Giles: A Retrospective, presented July 14 through August 22, 2015, in the Joan Mondale Gallery. It was a blockbuster show, garnering both critical acclaim and the highest sales from an exhibition in Textile Center history. When we formed our National Artist Advisory Council in June 2016, Mary was among the first artists we asked to join a distinguished cohort of artists – including Carolyn Halliday, Dr. Carolyn Mazloomi, Pat Hickman, and Tracy Krumm – to serve as advisors and advocates for Textile Center and to help take our organization to new artistic heights. In March 2017 we brought together the members of National Artist Advisory Council at Textile Center, hosting a series of activities and workshops – Fiber Art: Creating Ties That Bind – that gave our Textile Center members an opportunity to get to know these distinguished artists. In addition to opening two exhibitions: Commemorating His Purple Reign: A Textural Tribute to Prince juried by Dr. Carolyn Mazloomi, and National Ties: Contemporary Textiles from the National Artist Advisory Council, events included a reception hosted by Mary and her husband Jim Harris in their home … where they presented works by area artists Tim Harding, Morgan Clifford, and Jan Buckman. Up until her final days, Mary shared an exciting vision for all Textile Center can and will become, and Carolyn Halliday and I had the privilege to meet with her one last time in late March. “You are my people,” Mary said of Textile Center that afternoon. Mary’s work has been displayed in numerous galleries and museums in the United States, at the Barbican Centre in London, and she represented the U.S. at the International Triennial of Tapestry in Lodz, Poland. In 2013 she was named The Master of Fiber Arts by the Renwick Alliance of the Smithsonian Museum. Her work is included in the collections of over 15 museums, including the Minneapolis Institute of Art. Born Mary Jo Mortenson in St. Paul, she graduated from Mankato State University where she met and married Doug Giles. He became Director of Human Resources for the May Company in St. Louis, Missouri. After their divorce, Mary remained in St. Louis teaching in the Ladue School District. Upon her retirement she devoted herself as a studio artist and was variously represented by the Okun Galley, St. Louis and Sante Fe; R. Duane Reed Gallery, St. Louis; Sybaris Gallery, Royal Oak, Michigan; Mobilia Gallery, Cambridge, Massachussets; BrownGrottaArts, Wilton, Connecticut; and Hosler-Burrows Gallery, New York City. Mary married Jim Harris, a St. Louis architect, and upon his retirement moved to Minnesota. A major retrospective of her work is being organized by the Racine Art Museum, Racine, Wisconsin. Mary was an active conservationist working for wilderness protection with the Minnesota Land Trust and saving sea turtles with Verdiazul in Junquillal, Costa Rica. Diagnosed with ovarian cancer in 2014, Mary is survived by her husband Jim Harris, her sister Jane Sweeney (John E. Sweeney) Stillwater, and her brother Tom Mortenson (Mary Ellen Becker) Lehigh Acres, Florida. Services will be private. Tributes may be made to Textile Center or the Minnesota Land Trust.